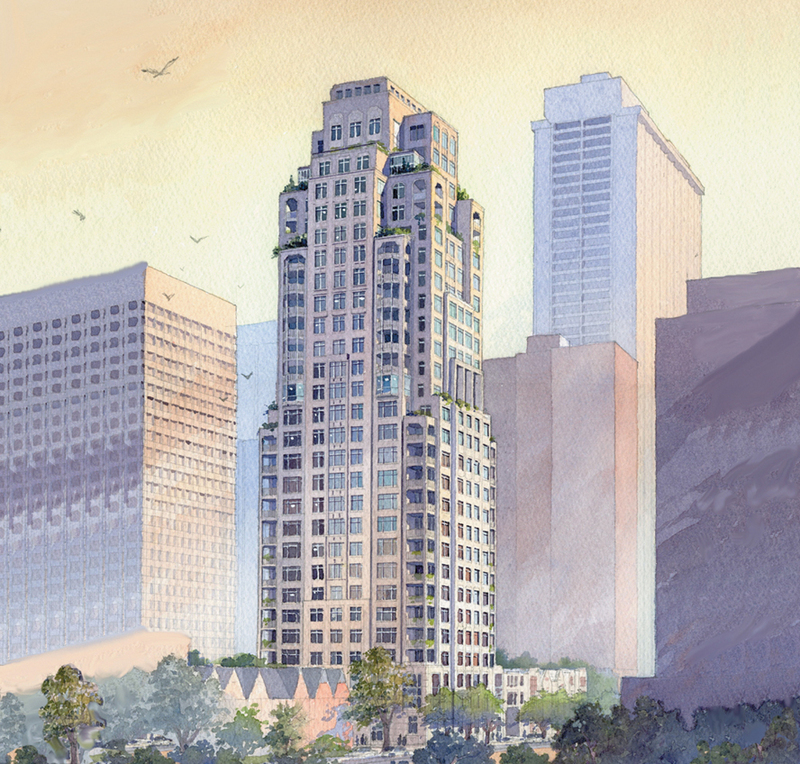 Architect: Robert A. M. Stern Architects • Yonge + Wright Architects Inc. This thirty-one storey ultra high end residential condominium project, also includes four high end townhouses, each with its own private elevator. It is located close to the trendy part of Bloor Street in downtown Toronto. The structure is carried on walls and columns founded on strip and spread footings, respectively, bearing on natural undisturbed soil, capable of safely sustaining a pressure of 750 kilonewtons, (ie. 15,660 pounds or 7.83 tons per square foot). The subgrade parking level slabs are typically 200 mm, or 220 mm, thick, to satisfy the spans, reinforced concrete flat slabs with 125 mm deep drop panels over the columns. At the east portion of the P1 parking level, there is an exception where the reinforced concrete flat plate is a 550 mm reinforced concrete transfer slab on 400 mm deep capitals designed to carry the party walls of the four townhouses above. The ground floor framing incorporates a wide variety of reinforced concrete slabs and beams, to satisfy different loading requirements and spans. There are seventy-nine beams in the ground floor framing, many of which are transfer beams with depths ranging from 1100 mm to 1800 mm. The floor slabs, from the twelfth floor level, up to the eighteenth floor level, are similar, 220 mm thick reinforced concrete flat plates, as in the levels below. Above the eighteenth floor slab level, the core is reduced, with the new configuration being maintained up to the twenty-first floor level, where it is further reduced up to the twenty-eighth level, where a private internal suite elevator is introduced between the twenty-eighth and twenty-ninth floor levels. All of the floor slabs from the nineteenth level through to the twenty-ninth level are 220 mm reinforced concrete flat plates similar to the floor slabs below the eleventh floor level. Lateral forces resulting from wind or seismic effects are resisted by the central core which encompasses elevator shafts, a scissor stair and mechanical shafts. Below the eleventh floor, two shear walls are added to the lateral forces resisting system.